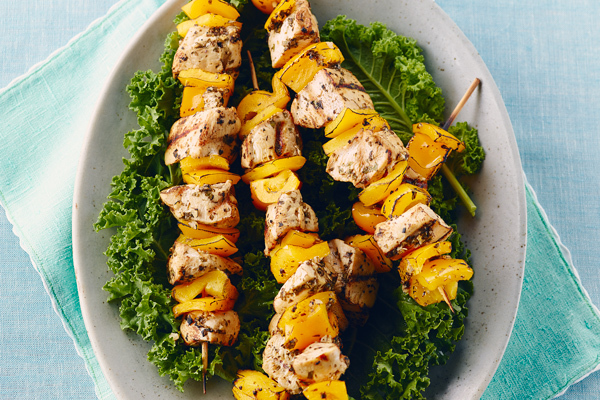 Enjoy the simple, clean flavours of fresh lemon and cilantro in these South African inspired kabobs. Cooking for one or two? Kabobs lend to perfect portion control and leftovers can be used for take away lunches or frozen for other meals. Sprinkle with salt and freshly ground black pepper. Pour over fresh lemon juice, olive oil and white wine. Toss to coat pieces. Finely mince garlic and cilantro. Scatter over chicken and toss well. Cover dish or seal bag. Place in refrigerator to marinate at least one hour and preferably over night. Cut peppers into 1 inch (2.5 cm) squares. Soak eight wooden skewers in warm water for 20-30 minute. Thread chicken onto skewers alternating with yellow peppers. Place skewers on plate and baste with any remaining marinade. Heat grill to medium-high. Grill kabobs until lightly browned and internal temperature reaches 165°F (74°C) – approximately 7-10 minutes per side. Baste along the way with any leftover marinade and turn half-way through cooking.